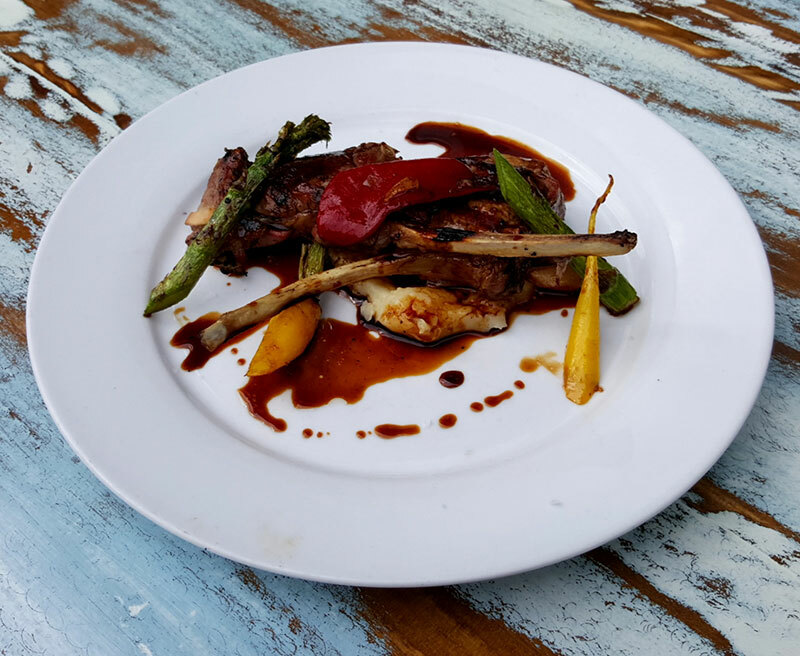 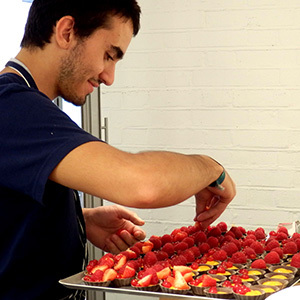 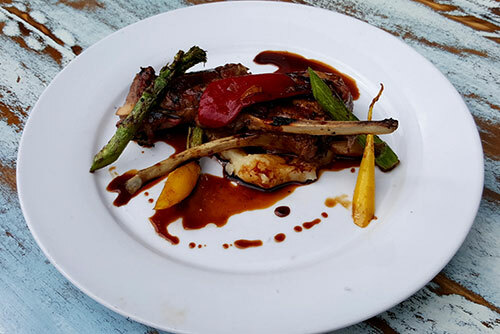 Our head-chef, Marcelo, learnt his trade from an early age growing up with his family being fanatical about food & cooking and always in the restaurant business. 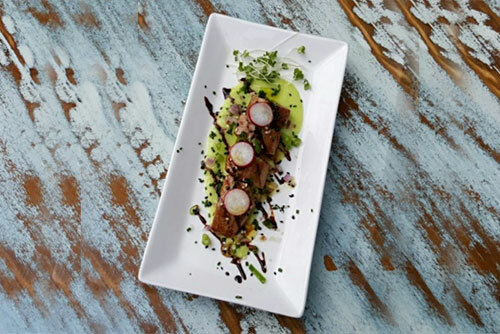 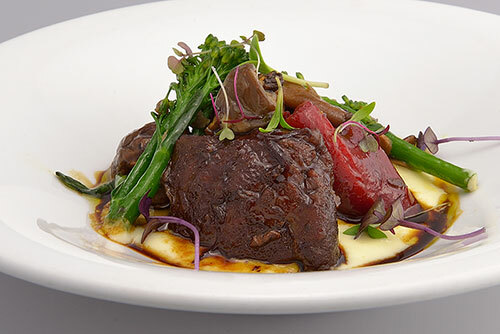 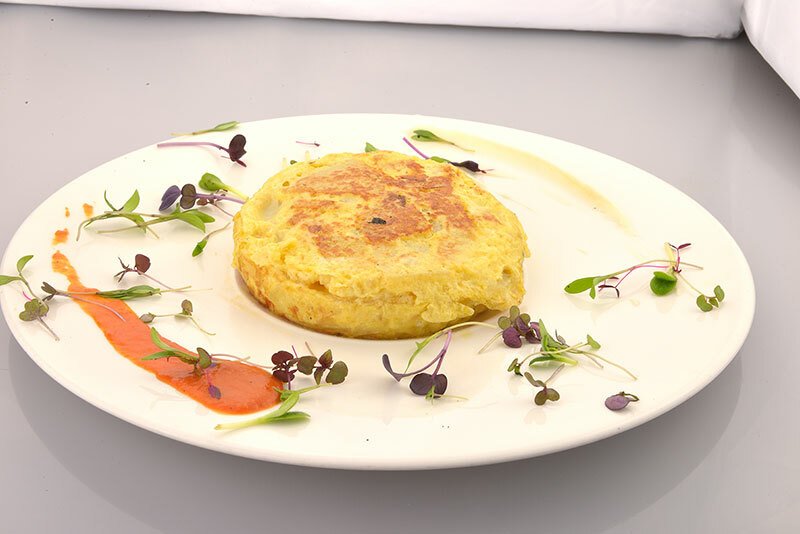 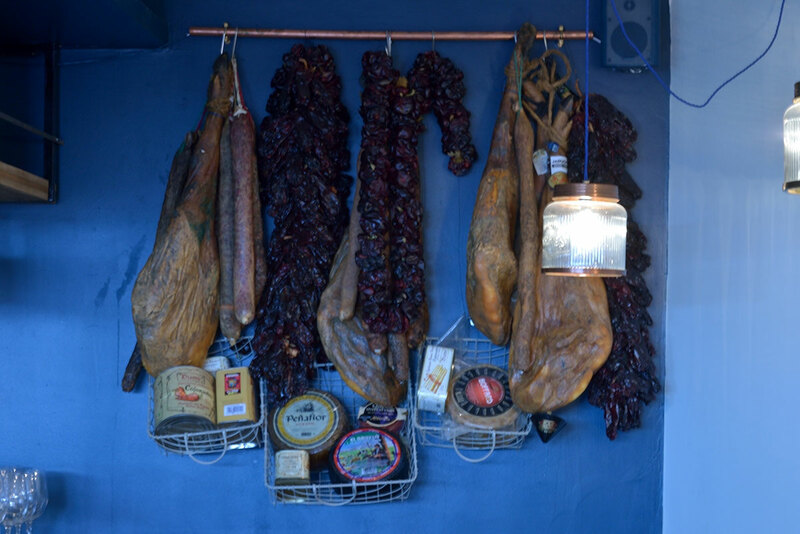 He fondly remembers bussing tables at his dad’s local eatery in Valencia, a region in Spain known for its adventurous culinary approach and this is emulated in his style which also bears some Japanese & South American influence owing to his travels. 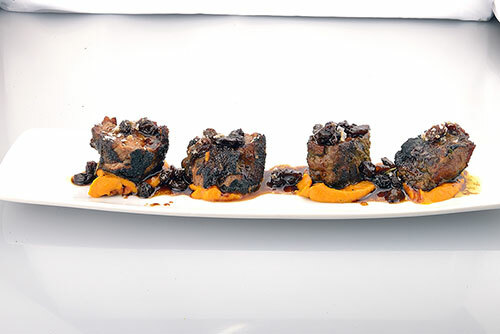 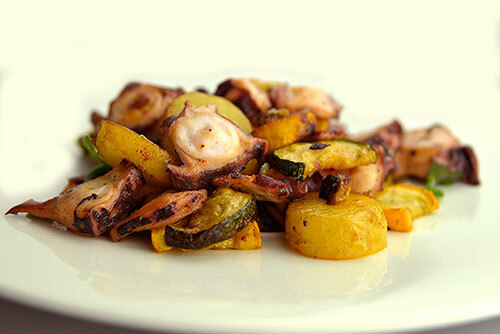 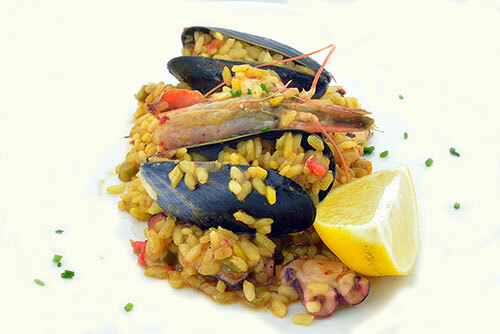 Along with experimenting new recipes, he loves fish, shellfish and olive oil. 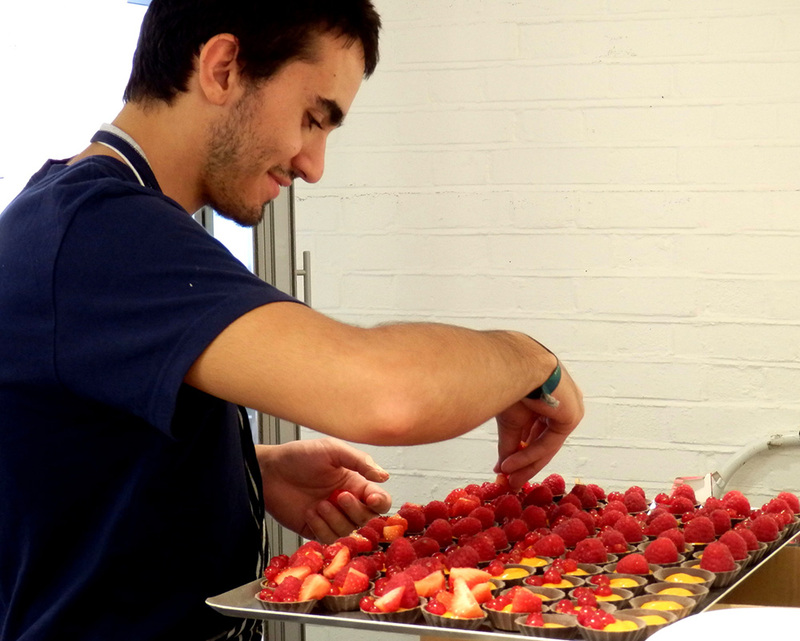 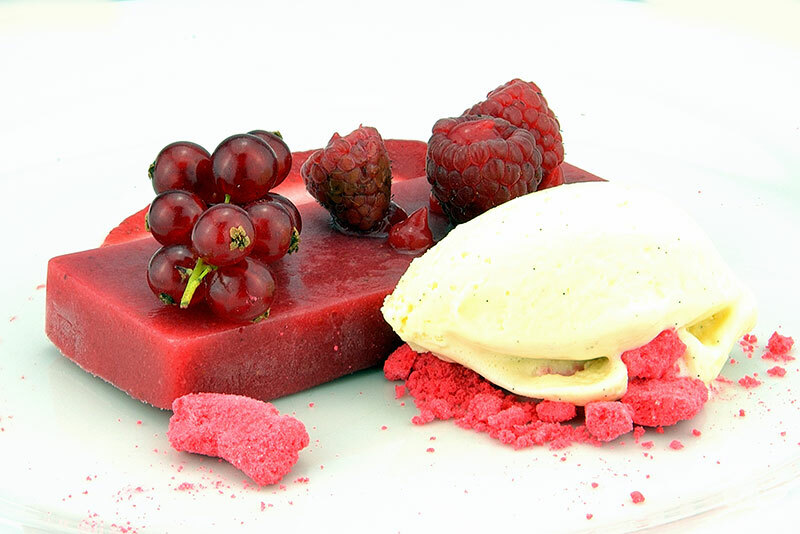 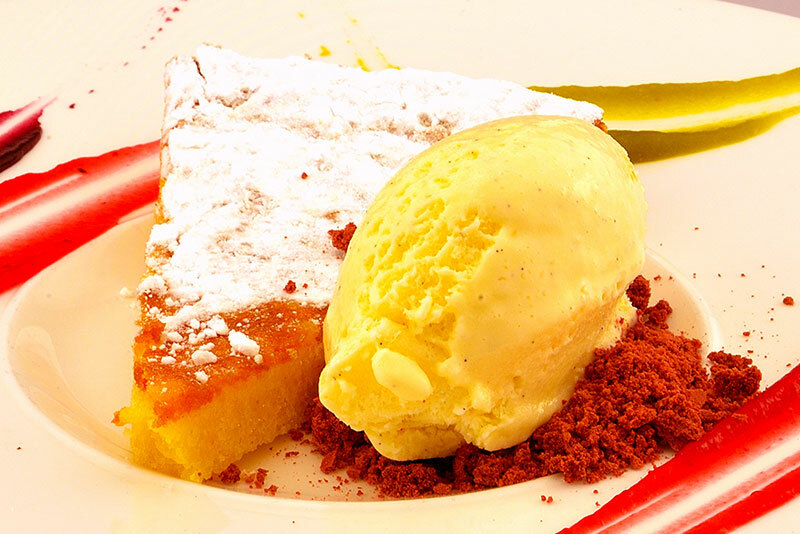 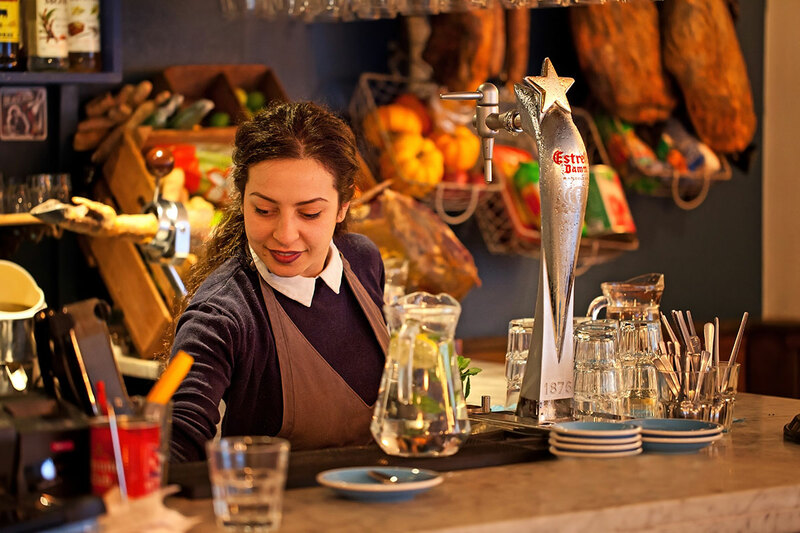 We source ingredients fresh every day from the best suppliers in London. 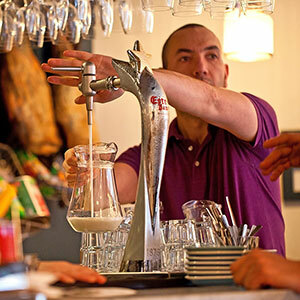 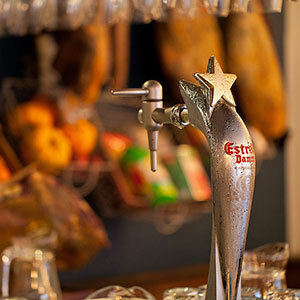 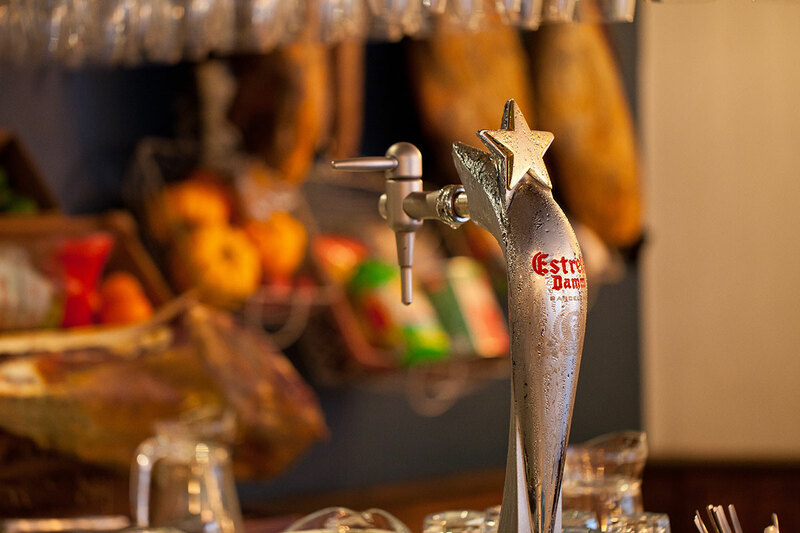 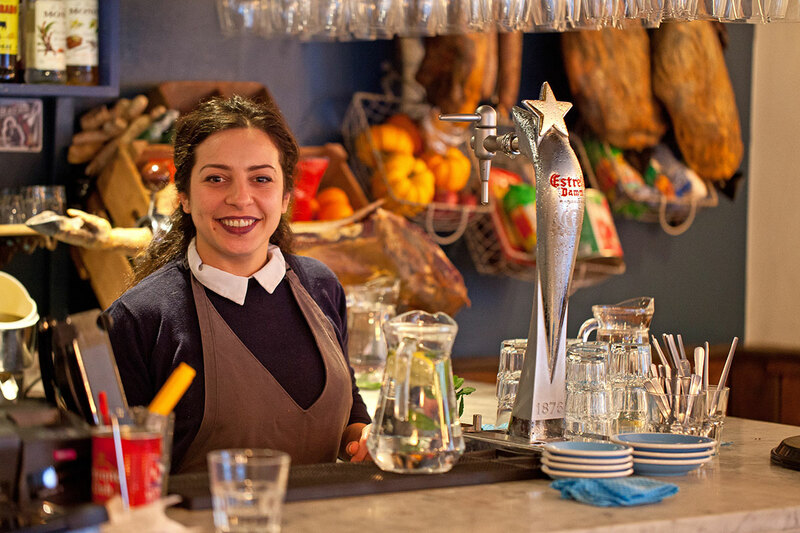 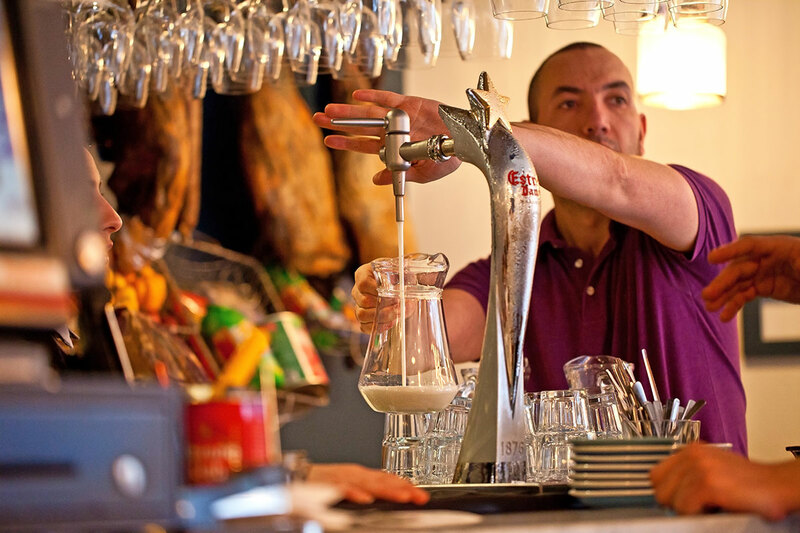 We also offer Jamón Ibérico freshly carved at the bar and served all day. 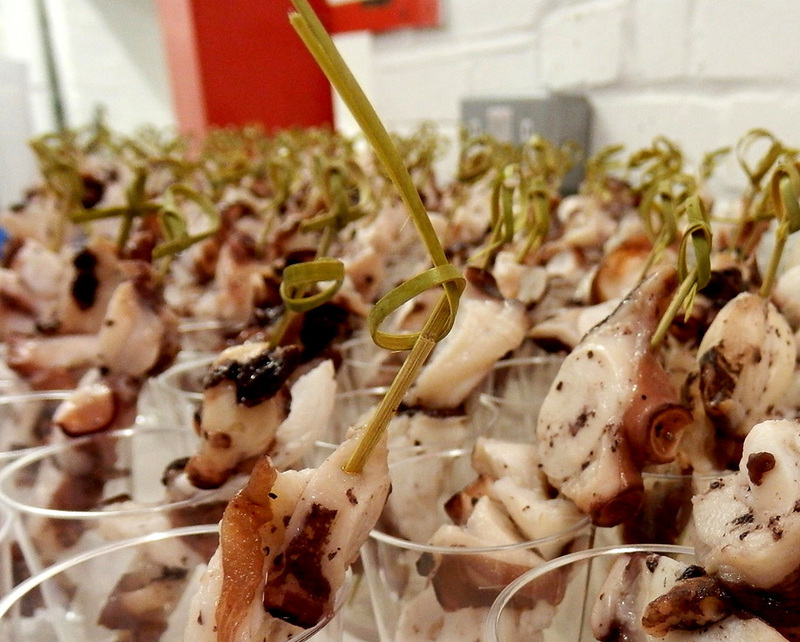 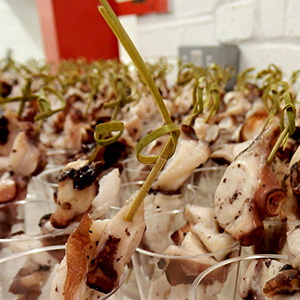 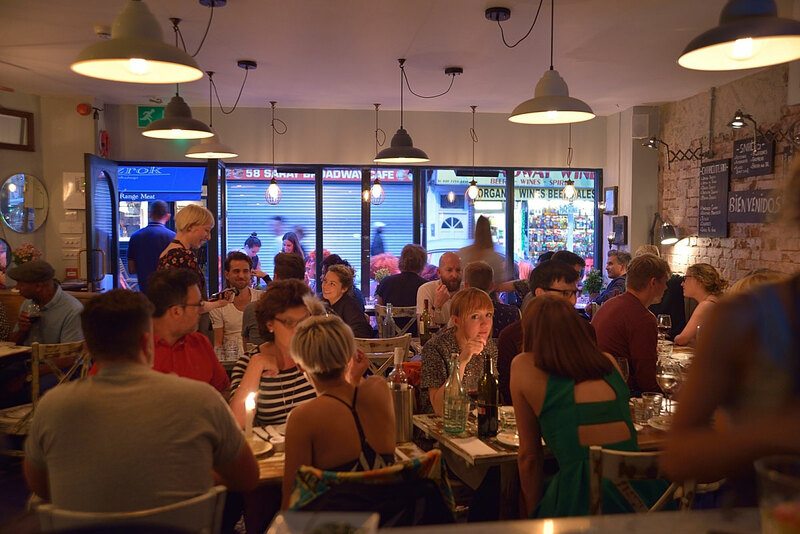 We are happy to cater for parties and can offer a bespoke set menu designed to meet you requirements. 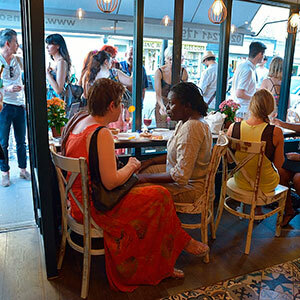 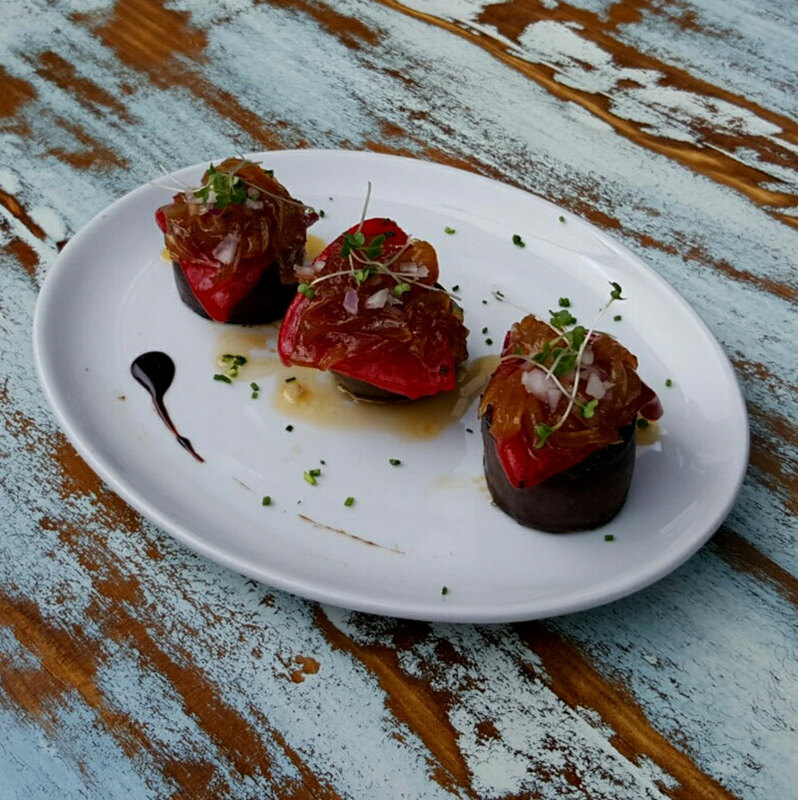 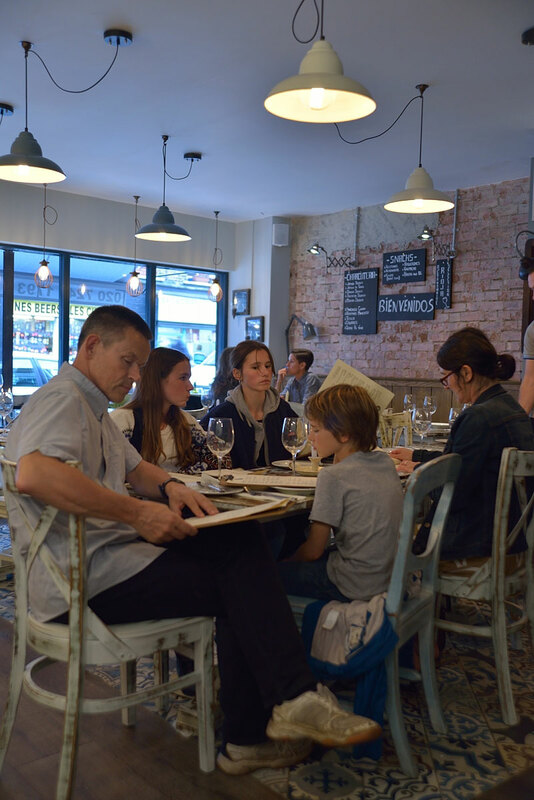 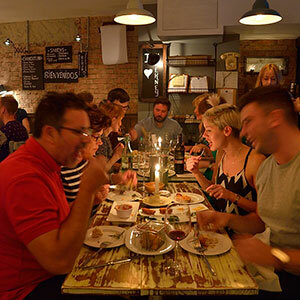 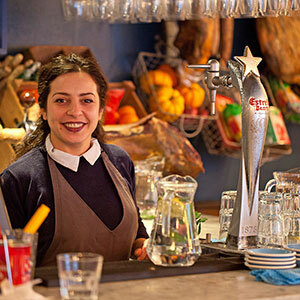 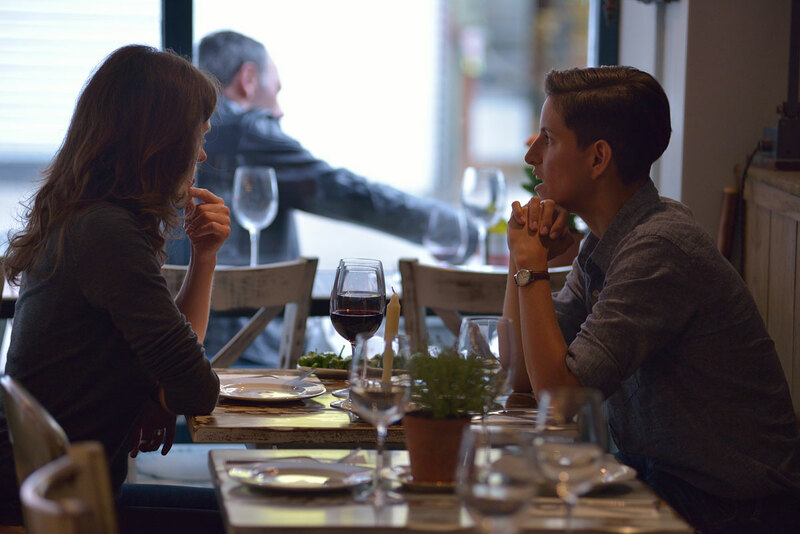 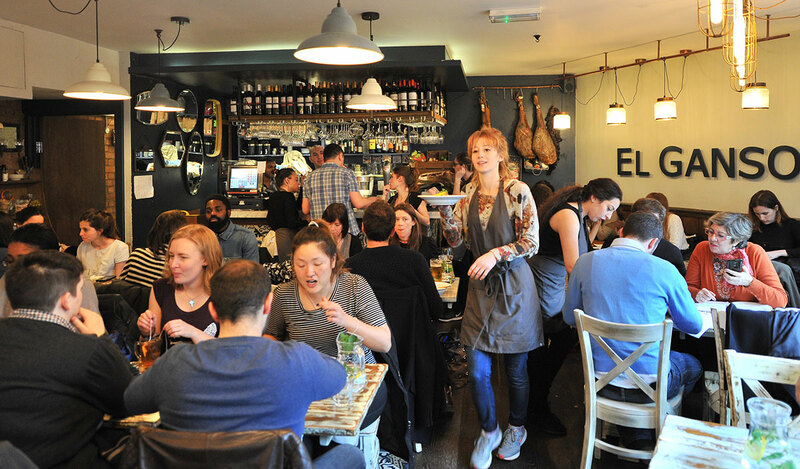 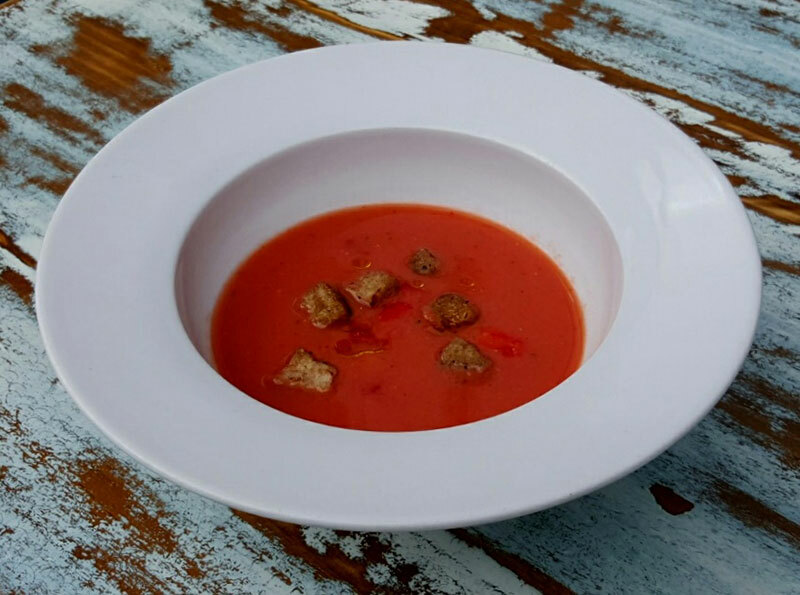 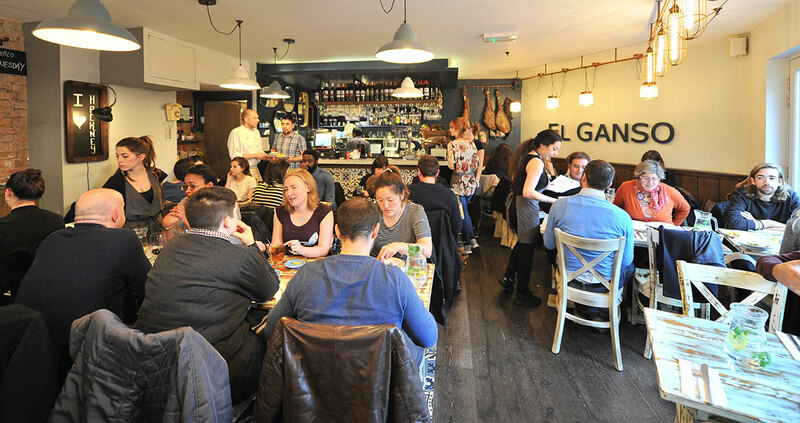 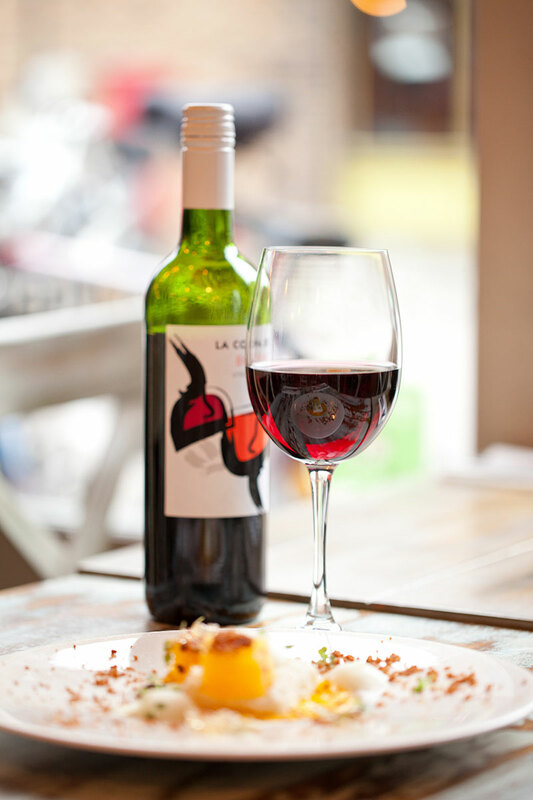 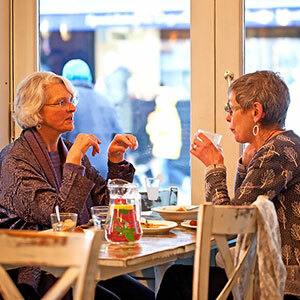 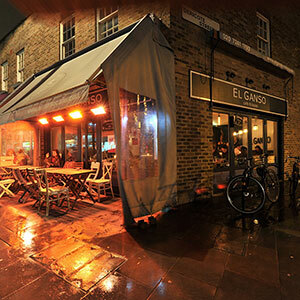 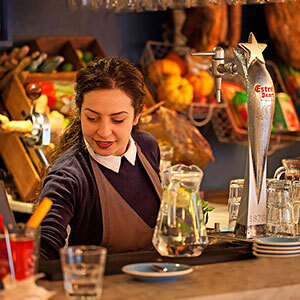 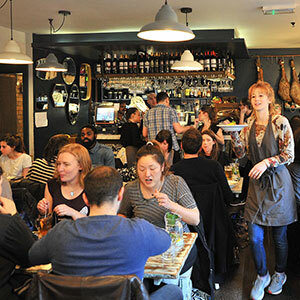 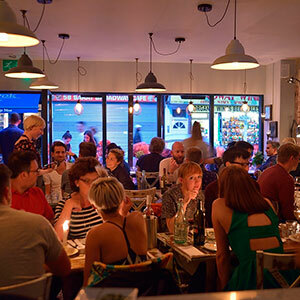 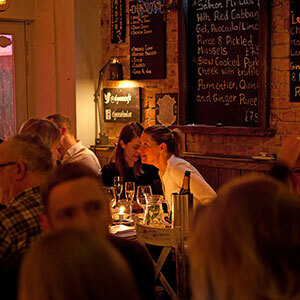 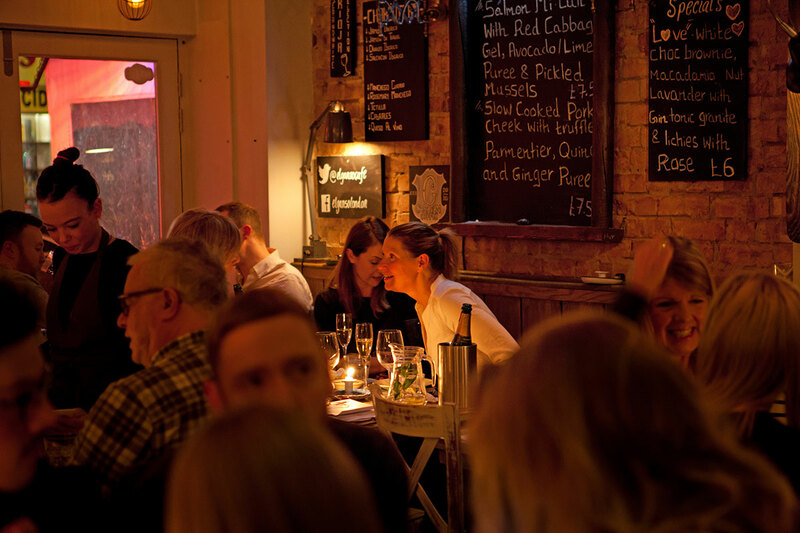 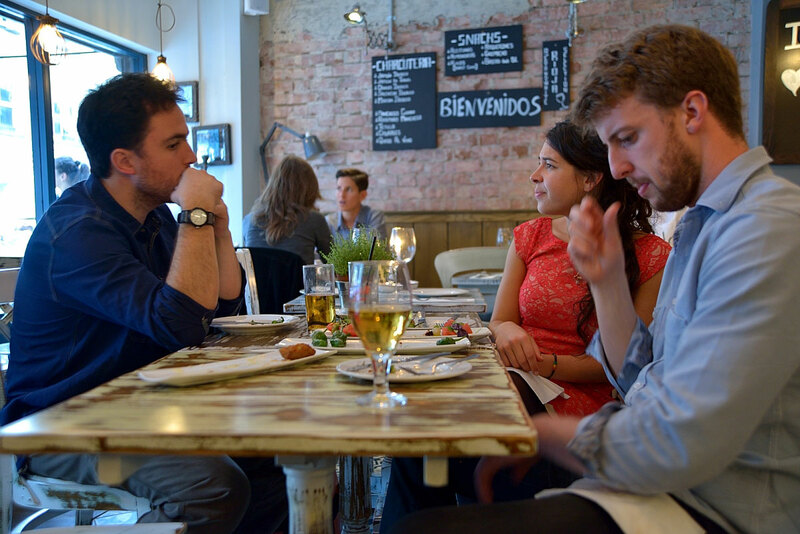 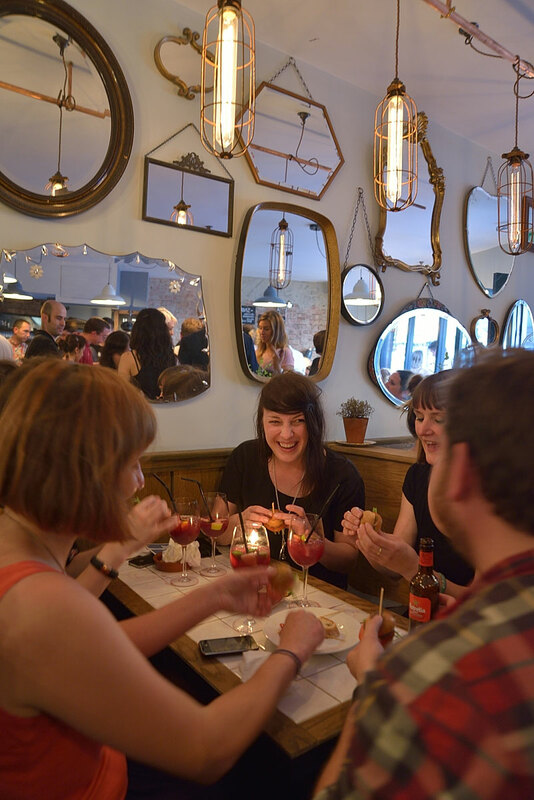 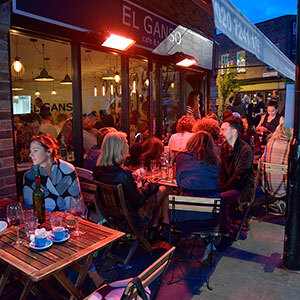 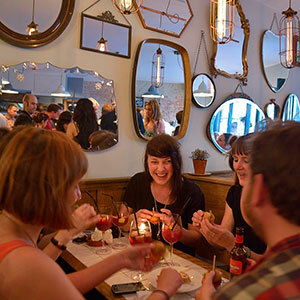 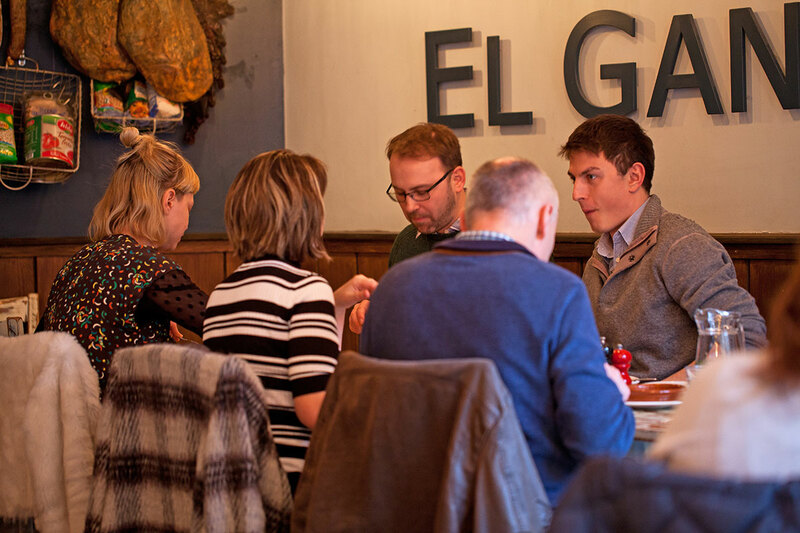 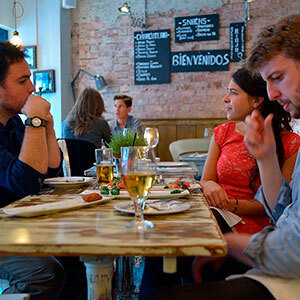 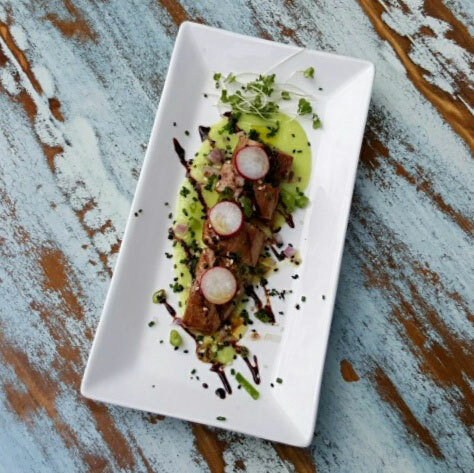 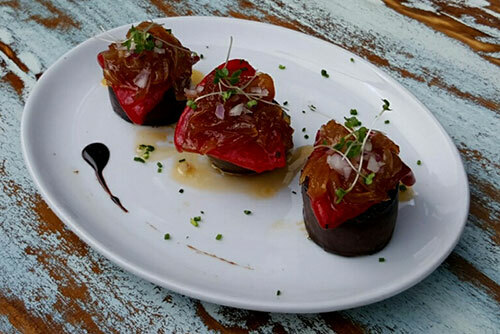 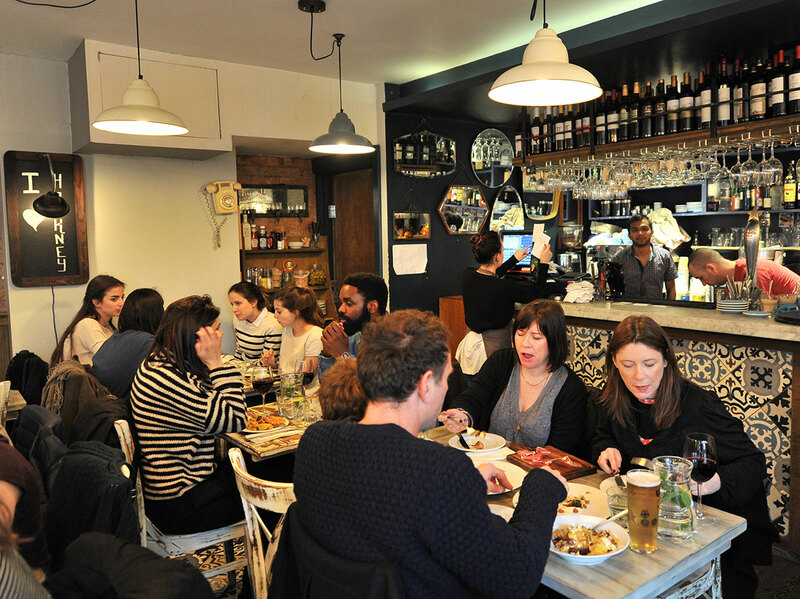 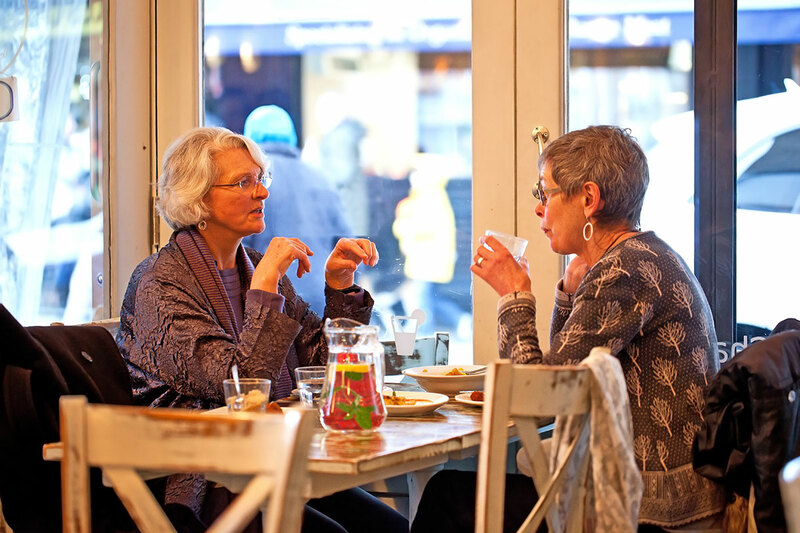 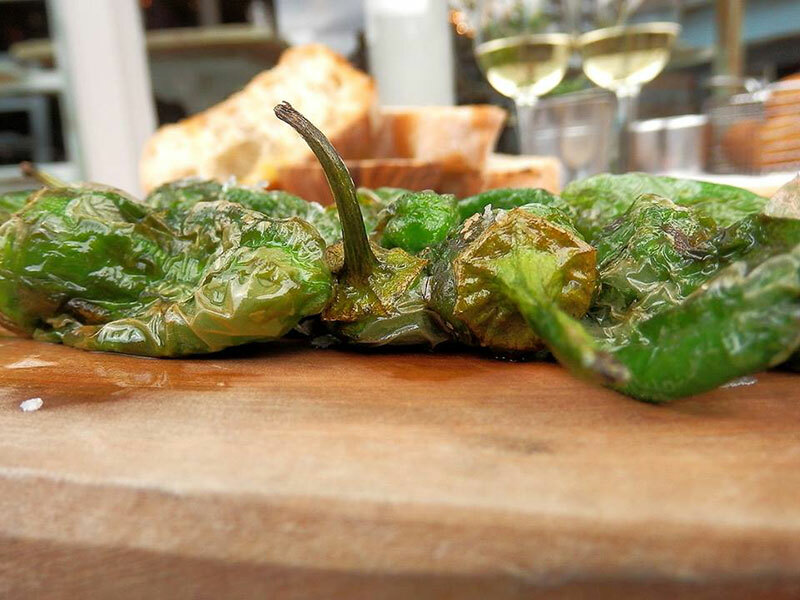 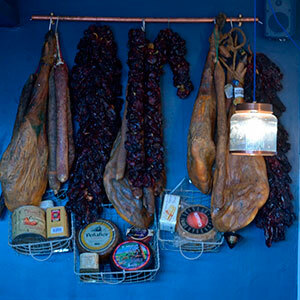 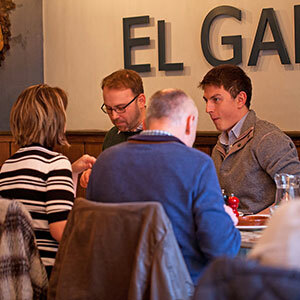 El Ganso is situated on Broadway Market, a busy traditional market street since the 1890s, now a chic down-to-earth hang out. 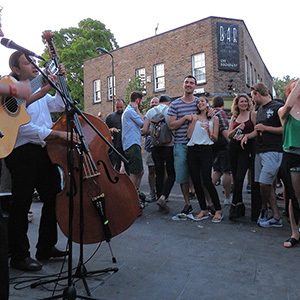 On Saturdays the market comes alive with artisan stalls selling anything from home-made sour dough bread to vintage handbags which creates a bustling must-see location for Londoners and tourists, offering many exciting independent boutiques and restaurants too. 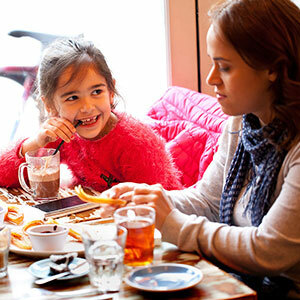 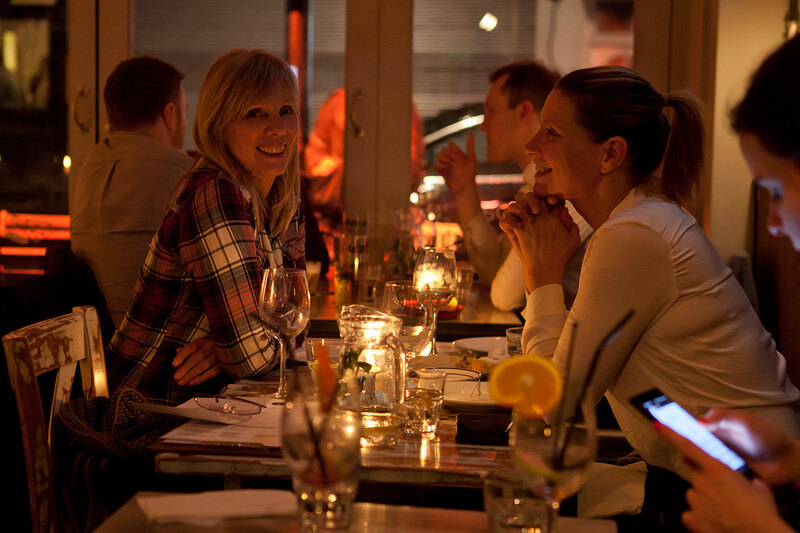 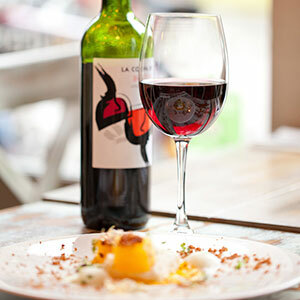 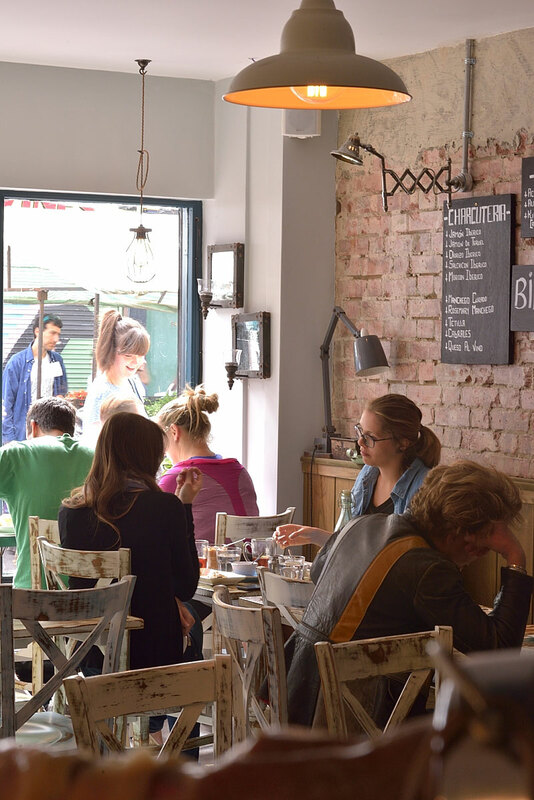 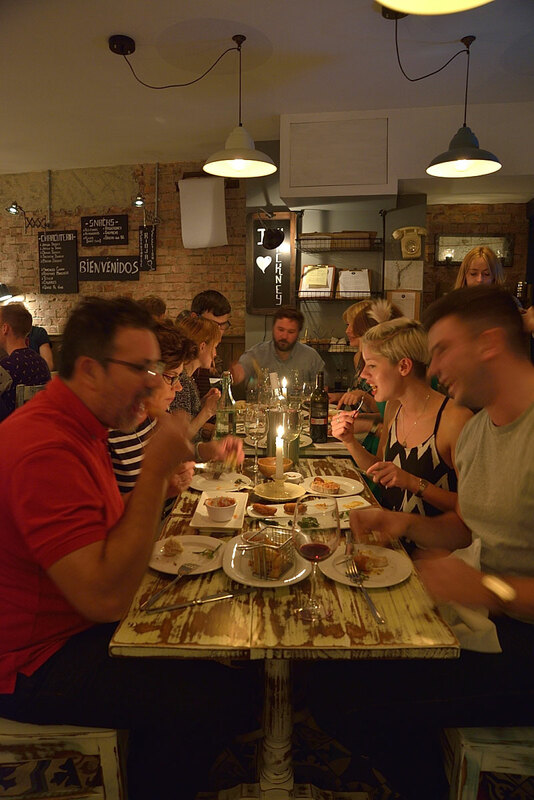 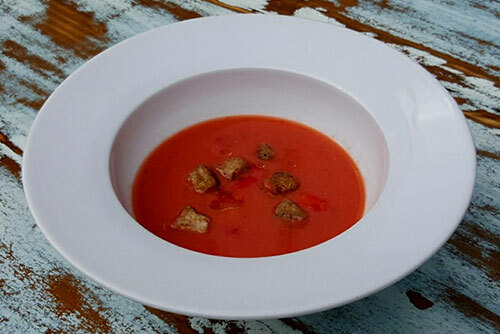 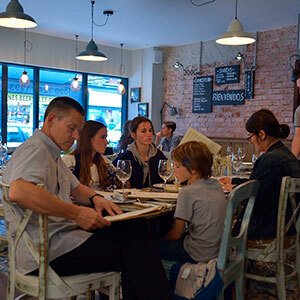 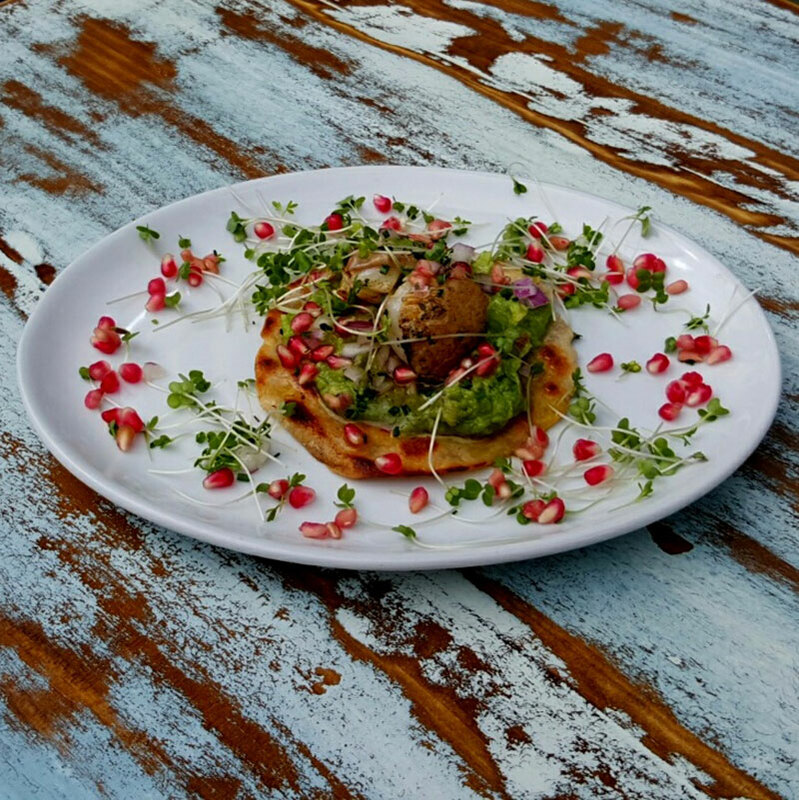 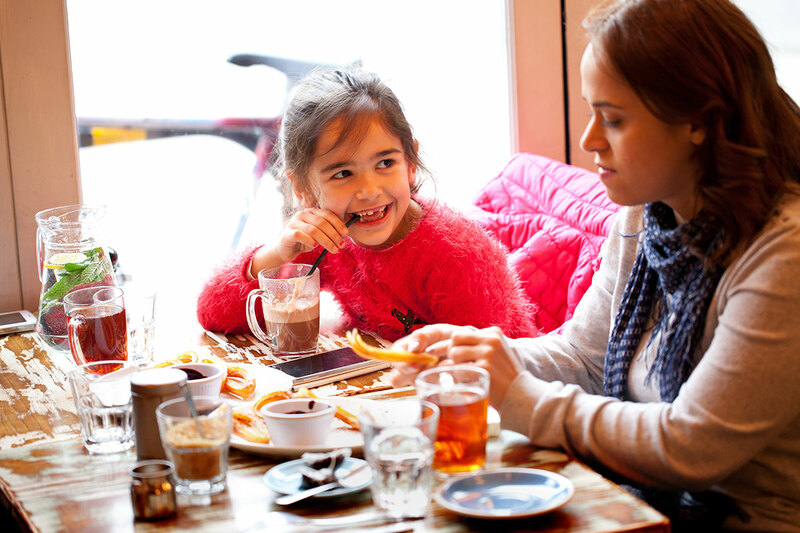 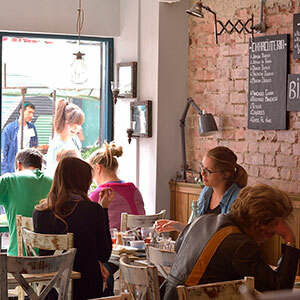 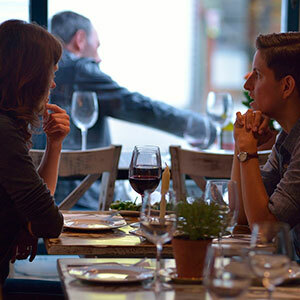 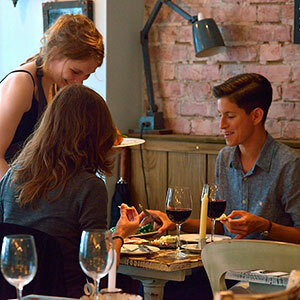 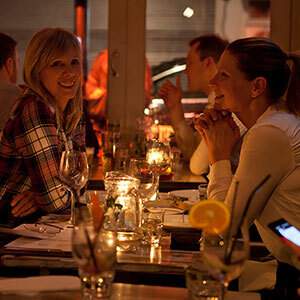 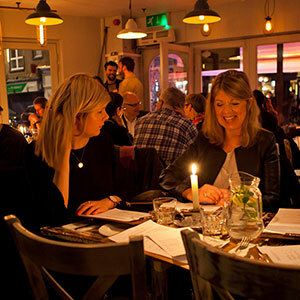 The restaurant itself is a comfortable meeting ground for young hipsters, families, friends and business people alike. 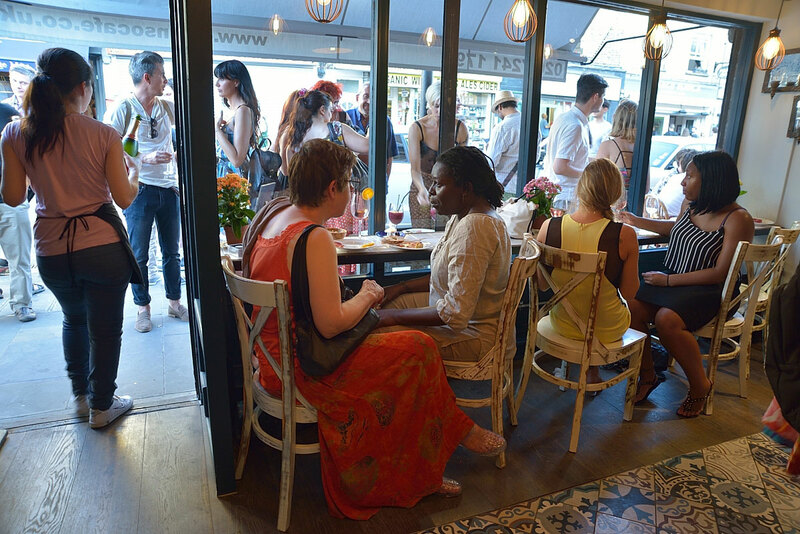 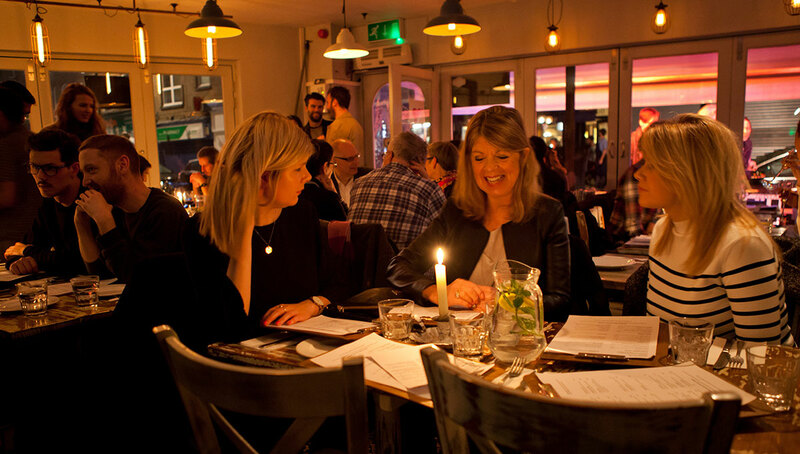 The venue is cosy, with comfortable banquette seating at the sides and small intimate tables in the centre that double up for larger bookings. 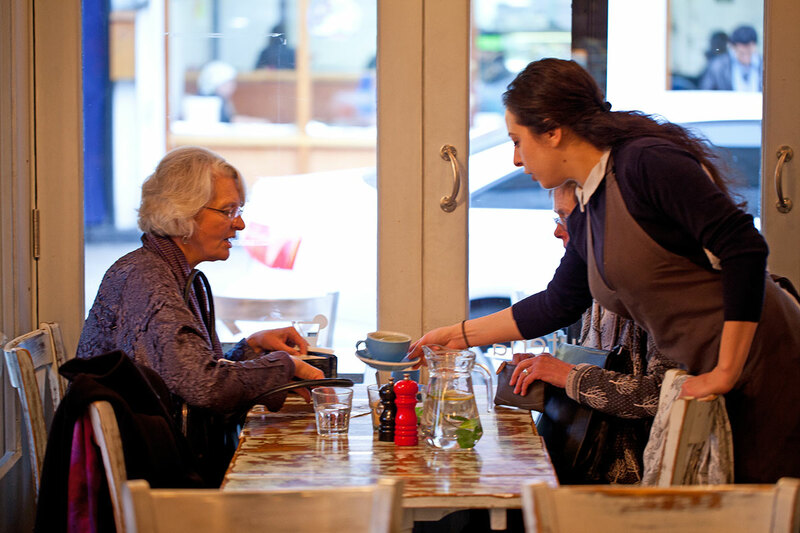 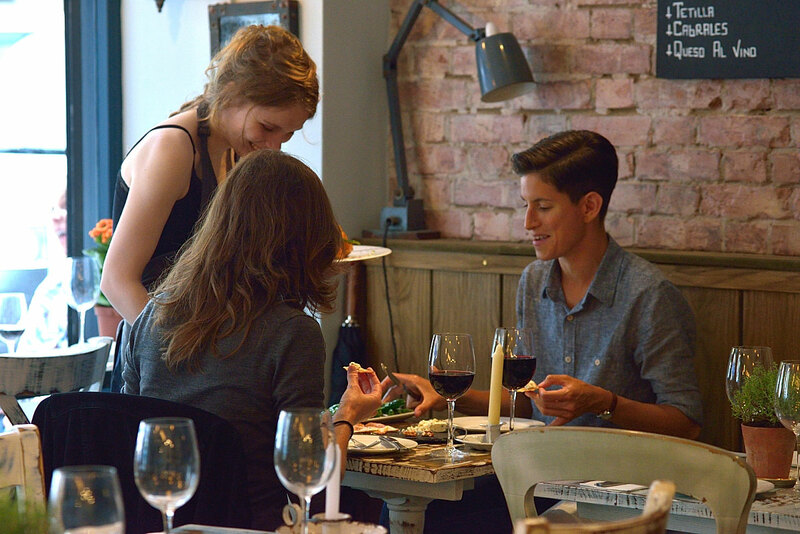 We offer both table service and takeaway. 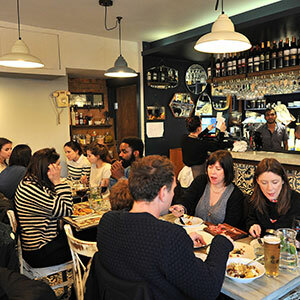 Bookings are accepted as well as walk-in when available. 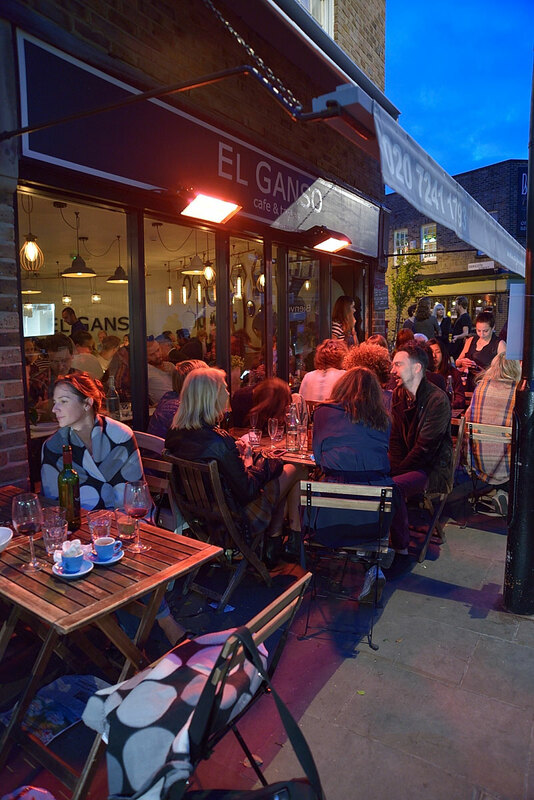 We have alfresco seating at the front of the restaurant on a buzzing market street. 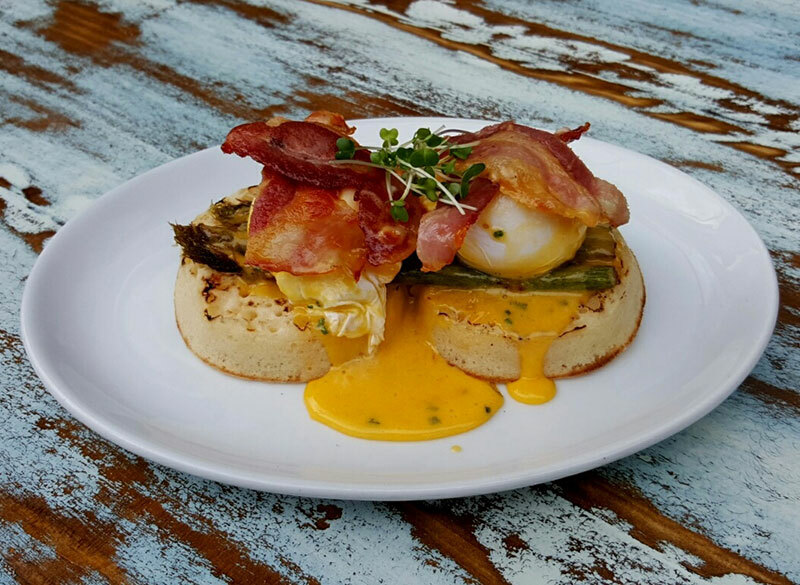 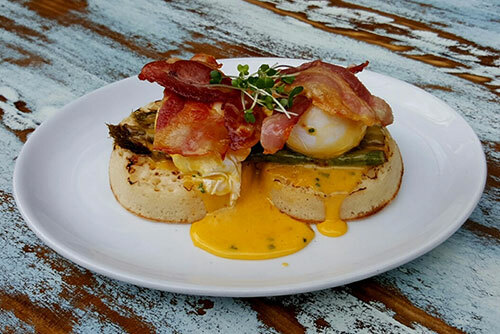 Breakfast is served from 8.30am, whilst lunch and dinner from the remainder of the day. 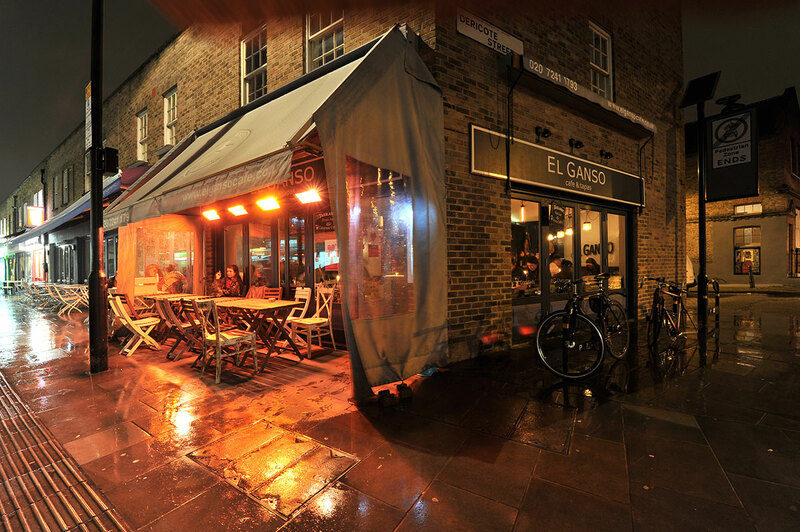 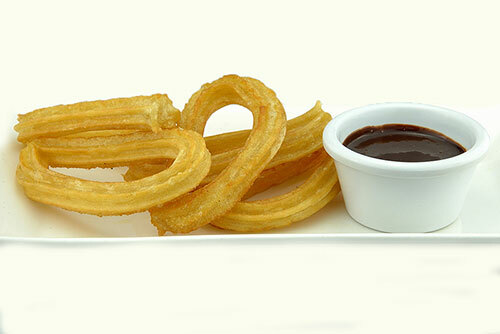 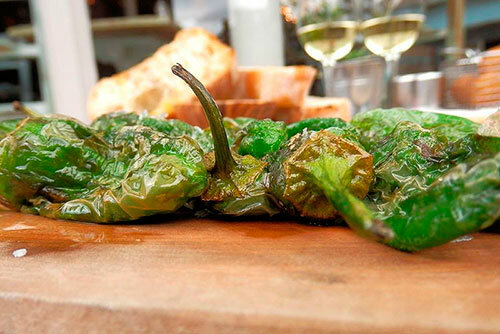 'El Ganso' is very proud to offer our a full out-side-catering service. 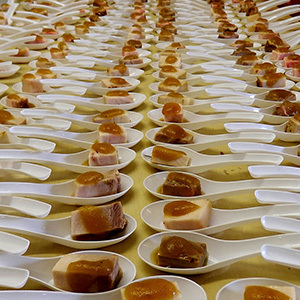 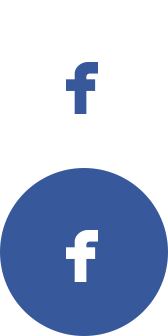 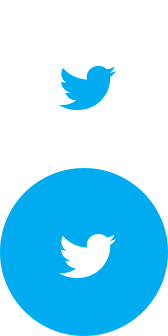 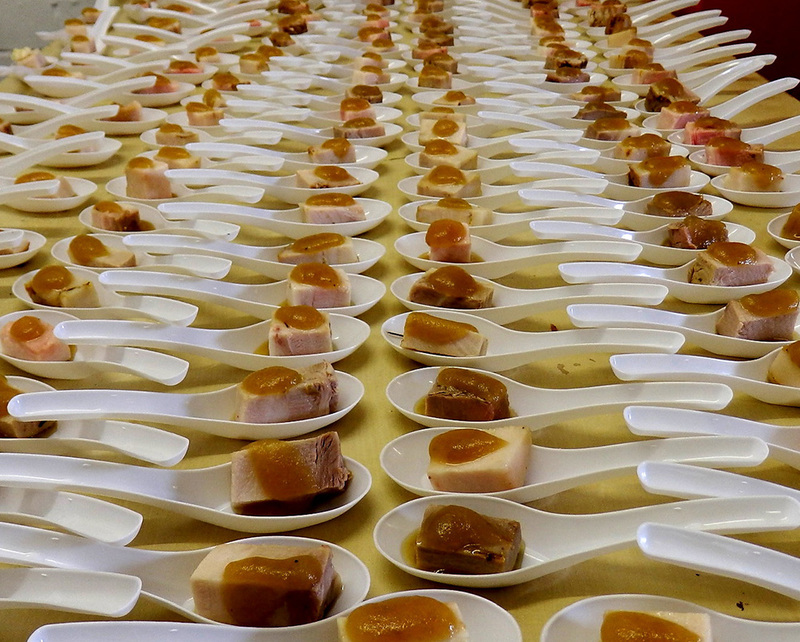 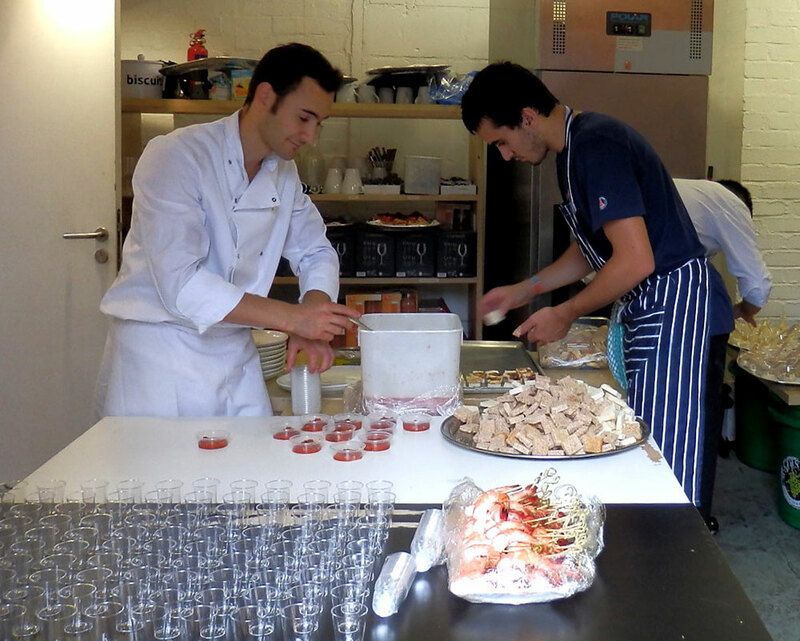 We can provide everything you may possibly need for your corporate or private event. 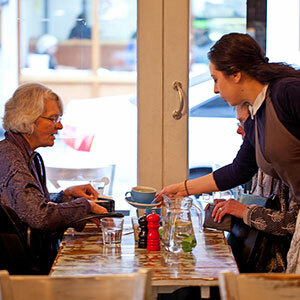 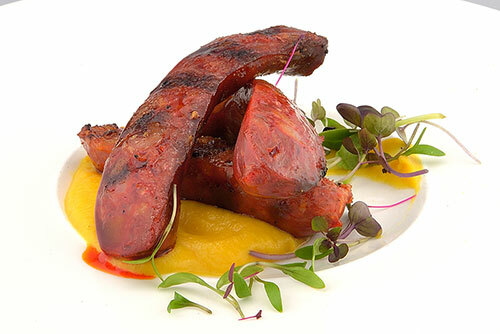 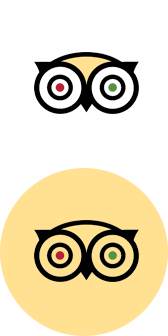 Ranging from full chef and waiter service to dishes delivered and self service. 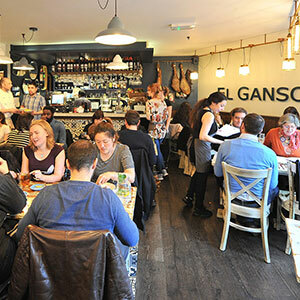 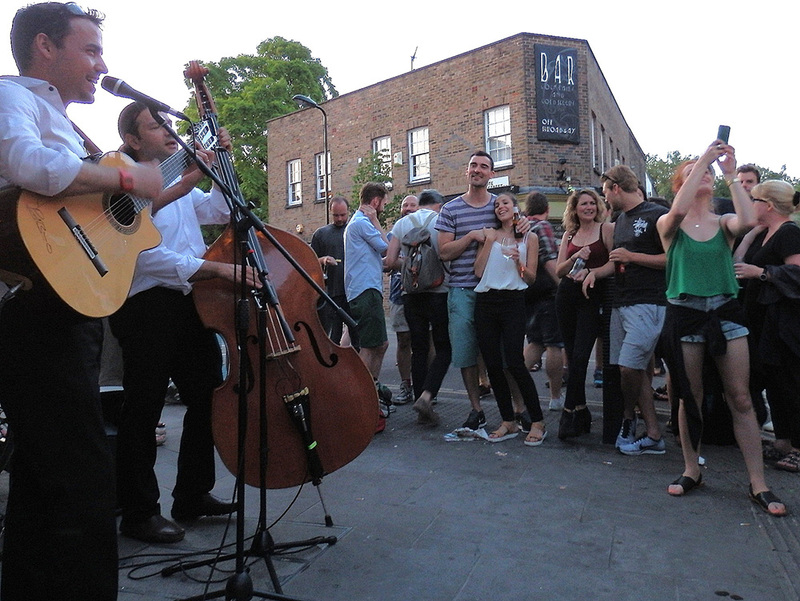 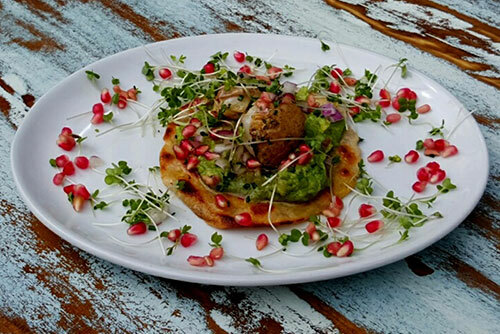 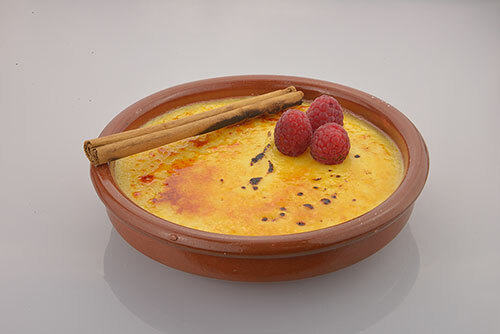 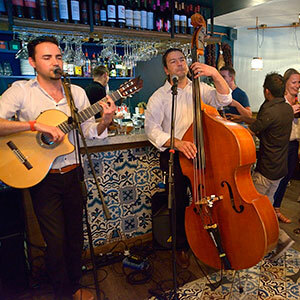 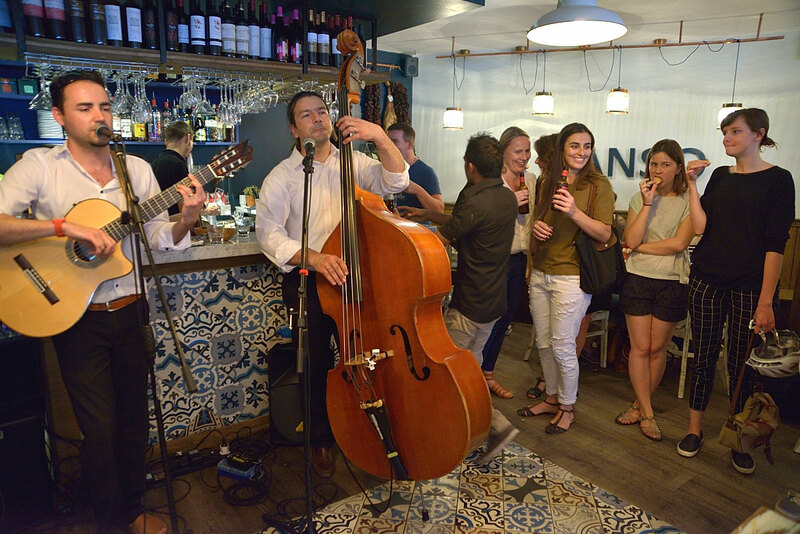 'El Ganso' also offers full in house catering for private parties and can even provide live music! 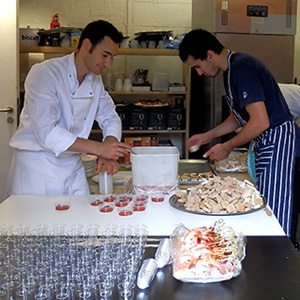 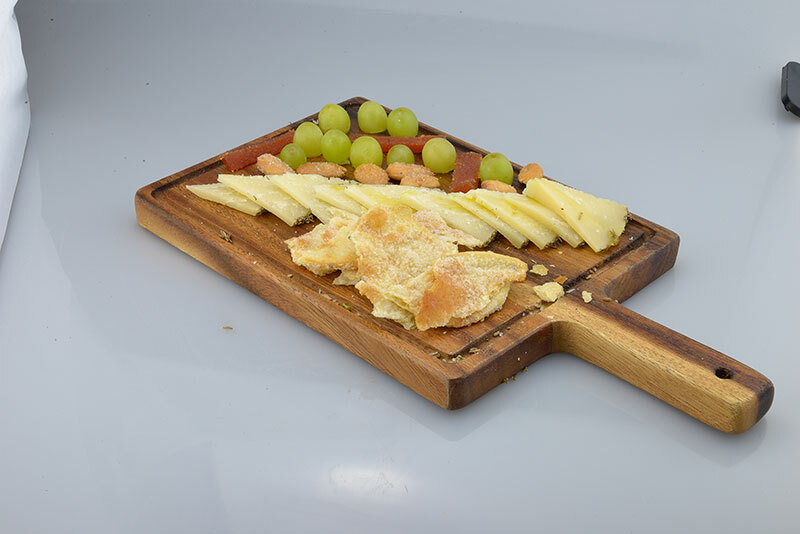 We are happy to consult on a made-to-measure menu customised to your requirements.